"The first volume of a projected multiple volume set. What if you had a very long book and made it longer? 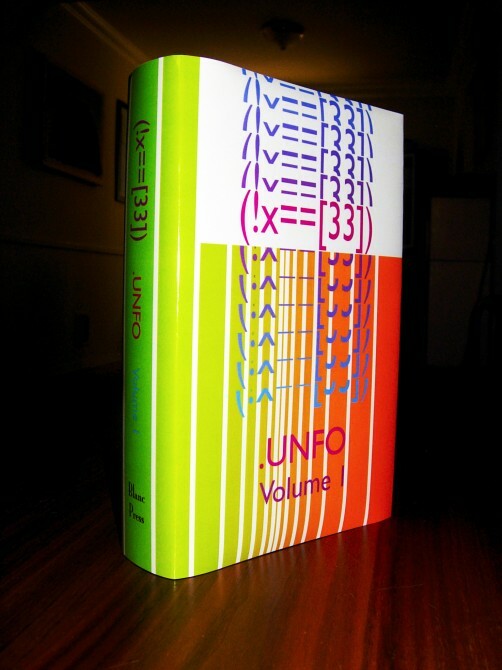 With (!x==) .UNFO seeks to indexically lengthen the world’s most monumental texts through failed software operations. (!x==) is curated by UNFO (Unauthorized Narrative Freedom Organization), an unofficial and temporary coalition of coders and writers, including Dan Richert and Harold Abramowitz." "To be clear: (!x==) Book 1 Volume 1 is a reformatting of Adolph Hitler’s Mein Kampf. The book itself, a conceptual work by .UNFO (a collaboration between Dan Richert and Harold Abramowitz) published by Blanc Press, acknowledges its source only obliquely. The publisher’s website simply tells us that this series “seeks to indexically lengthen the world’s most monumental texts through failed software operations”—that is, by filtering existing texts through the eponymous formula, redistributing chapters and paragraphs into chunks of approximately 33 syllables (rounded to the nearest whole word). On the book’s title page we find an innocuous url for a “0200601.txt” containing a (different) English translation of Mein Kampf archived by Project Gutenberg Australia. Indeed, the source text is apparent enough. We read the signature that follows the author’s forward, the table of contents, the recurring page header: MEIN KAMPF. It seems evasive, even disingenuous, certainly loaded, to characterize this project in such detached terms as a conceptual exercise, a “failed software operation”—the predictable imperfection, somehow poetic, of a system applied to lived reality. This instrumentalization maintains the willfully problematic stance that words are just words—stuff, material, to be shoveled around at will. These are Adolph Hitler’s words, written in German in 1926, hastily translated by a New School committee in 1938, adapted for an artwork by .UNFO in 2011. The present iteration underscores the ability of a certain indexical “aura” to survive these various semiotic filtrations. In this light, (!x==) prompts the reader to reconsider the ostensible amorality of the appropriations of the Internet age, the Internet being an ever expanding aggregation of text and images, a rhizomatic systems-based poem increasingly divorced from context. The equation (!x==) is a logic operation in Perl script, where “x” is either true or false. Hitler’s text is held up for judgement, in some subjective sense, as morally tainted material; yet it is parsed by a computer program for which true and false are de facto and absolute: an operation of digital truth. While we might see certain chunks containing more or less than 33 syllables as “failed,” this is a human sentiment—and what’s more, an irregularity foreseen by the programmers. The “rewards” of a sustained reading of .UNFO’s book are few and beside the point. It is a conceptual work, after all—one that hinges on the realization that this is Mein Kampf, that book, the kind of text that tries the convictions of the defenders of free speech (for it is, after all, for all its historical importance, a book of genuine and pointed hate). For better or worse, Hitler’s book is a symbol even to those who haven’t read it; the ostensibly mechanized .UNFO text functions insofar as Hitler’s book has already been judged. Thus any condemnation of this book is already built into its program. It is a book designed to be damned. The .UNFO text is a structuralist gesture bordering on bad faith that predictably fails to overcome its material.